Truckers hauling goods and materials south through California’s San Luis Obispo County are facing longer drives and indefinite delays after deadly mudslides closed Highway 101 in Santa Barbara County. Storms swept through the Central Coast Jan. 9, spelling trouble for areas ravaged by the Thomas Fire in December. 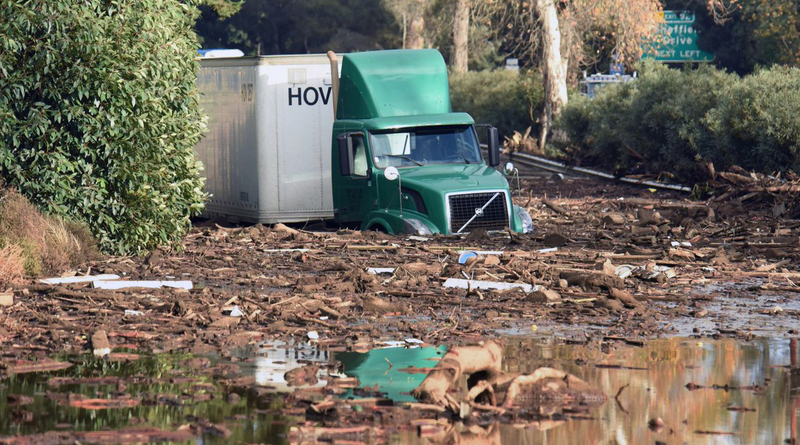 Santa Barbara officials on Jan. 11 said 17 people died as a result of mudslides and flooding. Twenty-eight people were injured and as many as 43 are still missing. The storm also flooded Highway 101 with water, mud and debris, and Caltrans closed both sides of the road from Highway 150 in Carpinteria to Milpas Street in Santa Barbara through midday on Jan. 15. This means travelers and truckers will need to use Interstate 5 as a detour to and from Southern California, sending drivers inland and entirely cutting off portions of the coast to traffic. Tom Shults, a dispatcher for Michael Dusi Trucking in Paso Robles, said the company has had trouble delivering Firestone Walker Brewing Co. products to some coastal cities due to the closure. The quickest way for Central Coast drivers to reach Highway 5 is by traveling east on Highway 46 from Paso Robles. Highway 166 on the San Luis Obispo-Santa Barbara County line is another option. For truckers driving south, the San Paso Truck Stop at the Wellsona Road-Highway 101 intersection is one of the last waystations before they would need to exit Highway 101. Joe Orcutt, a trucker for Sacramento-based Devine Intermodal, had to stop at San Paso on the morning of Jan. 9 after his dispatcher realized he would not be able to deliver the glass bottles he was hauling to Santa Barbara. “It’s just part of the business,” he said. Orcutt said he’s been a trucker since 2000 and has encountered many different road closures. Sometimes, the dispatcher will just have him wait at a truck stop until the road is clear and he’s able to travel again, he said. He was still waiting for instructions on Jan. 9 at the truck stop.